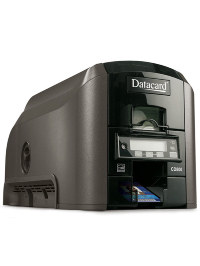 The Datacard CD800 card printer allows you to print higher volumes, longer runs, and more complex cards with a higher level of efficiency all from the convenience of your desk. From student and government ID cards to corporate employee and visitor badges, the CD800™ card printer keeps lines moving while helping to protect your assets and people. Protect your investment with the modular design of the CD800 card printer. As your ID card issuance needs change in the coming years, rest assured your CD800 printer will continue to meet your requirements now and in the future as a completely scalable printing solution. The CD800 card printer revolutionizes high-quality printing with the industry’s first print resolution of 300 x 1200 dpi. Fine text, complex two-byte characters and 2D bar codes print as sharp and legible as they appear on-screen. Datacard® exclusive TrueMatch™ technology closely matches the colors on the card to the colors on your screen, reproducing images in vibrant colors. Improve energy efficiency and promote environmental commitments with the Earth-friendly, ENERGY STAR® qualified CD800 card printer. Biodegradable supply cores made with EcoPure® additive, recyclable packaging and power-down button all contribute to the environmentally conscious CD800 printer operation.